MANILA, Philippines – University of the East's (UE) veteran players struggled to make much of an impact in their UAAP Season 80 game against University of Santo Tomas (UST) on Wednesday, with even Shaya Adorador unable to contribute. Head coach Francis Vicente had hoped that the Lady Warriors would play inspired volleyball against the Tigresses, especially after they pushed University of the Philippines (UP) to five sets in their season opener. Instead, they came out sluggish, leading the coach to turn to some of his less-experienced players, hoping that they can give the Lady Warriors a lift. Jana Sta. Maria and Zilfa Olarve gave a good account for themselves in limited minutes. Sta. Maria had four points in two sets, while Olarve scored the same number despite entering as a reserve in the third frame. For comparison, starter Shaya Adorador mustered only two points despite seeing action in all three sets. "Pinasok namin 'yung mga taong gustong pumukpok," Vicente explained. "Baka sakali, 'yun 'yung maging key point para makakuha man lang kami ng isang set." His reserves were still unable to lead the Lady Warriors to a win. They had no answer for UST's Sisi Rondina who led the Tigresses to a 25-17, 25-15, 25-21 victory. Still, Vicente sees his bench players' contributions as one of the few positives that they can take away from the loss to UST. The problem now, he said, is the performance of his starters. "Kailangan, ang mga beterano namin, mag-step up na talaga. Nagre-relax eh," he lamented. "'Yung starters, nagre-relax masyado, masyadong hindi nila ma-control 'yung kumpyansa nila sa sarili. Kaya tuloy, marami nagiging mali." Indeed, Adorador was not the only UE starter who failed to make an impact. Skipper Roselle Baliton only had two points, and Seth Rodriguez managed four. Mary Ann Mendrez (10 points) and Judith Abil (9) were the two other bright spots for UE on Wednesday. Libero Kath Arado was as solid as ever, with 15 digs and 11 receptions. With their Season 80 campaign off to a 0-2 start, Vicente simply wants his players to learn from what happened to them in their first two contests. "Siguro, we just learn from this game," said Vicente, whose team has won only two games in the past two seasons. "'Yun nga ang lagi kong sinasabi – hindi basta inaabot ang game sa isang team. Kailangan, pag-trabahuhan mo 'yan." "Kailangan talagang 'yung mindset mo, pagpasok mo sa loob, ibigay mo lahat." 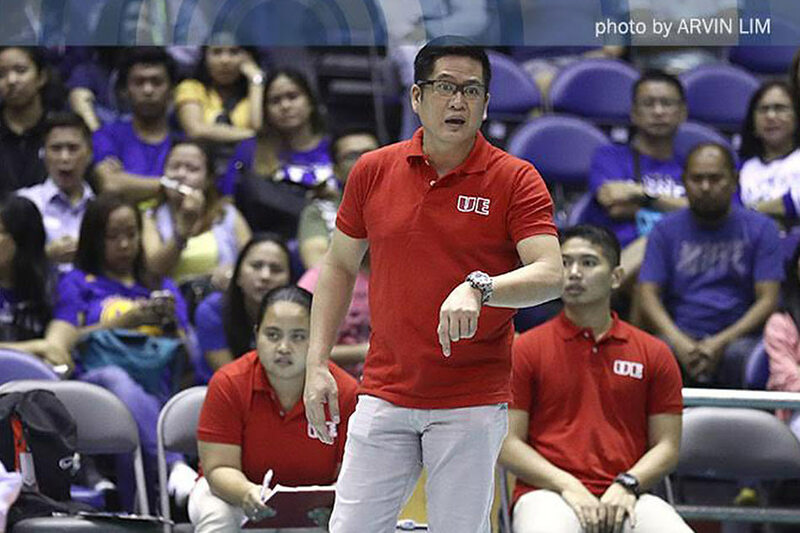 UE will try to bounce back on Sunday when they take on unbeaten National University.